London is currently undergoing one of the largest construction projects in Europe, building a new underground line, which up until recently was called Crossrail. 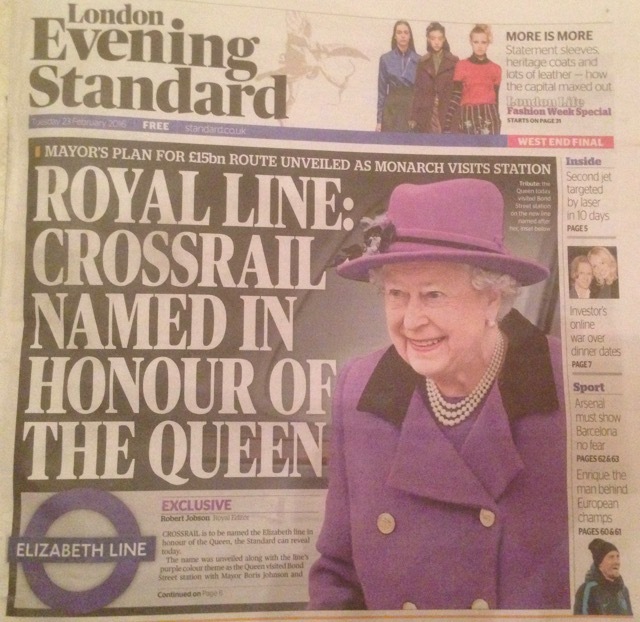 On 23 February 2016, that new line was officially named Elizabeth Line in honour of the Queen, Queen Elizabeth II. It was named as part of a royal visit by the Queen to one of the new stations next to the existing Bond Street Station that currently operates on both the Jubilee Line (named to mark 25 years since the Queen’s accession to the throne) and Central Lines. The new Elizabeth Line will be purple in colour, and in keeping with each of London Underground lines having a unique colour. The cost of this new tube line is estimated at £15bn, the line will serve Heathrow Airport, allowing for quicker journey times from the airport to central london, as well as expanding rail links to both the east and west of London. IT is expected that around 200 million people will use the new line every year once it is fully opened in 2019, although the first stops will open in May 2017. Journey times from Heathrow Terminals 2 and 3 to Bond Street station in Central London should take around 29 minutes, with trains running every 2.5 minutes, this is in contrast to the current tube journey time of around 50 minutes. The Queen was the first member of the Royal family to use the underground when she opened the Victoria Line in 1969. Charles was the Royal chosen to open the Jubilee Line in 1977 to celebrate the Queen’s 25 years on the throne. More information on London Public transport is available on our Public Transport page.